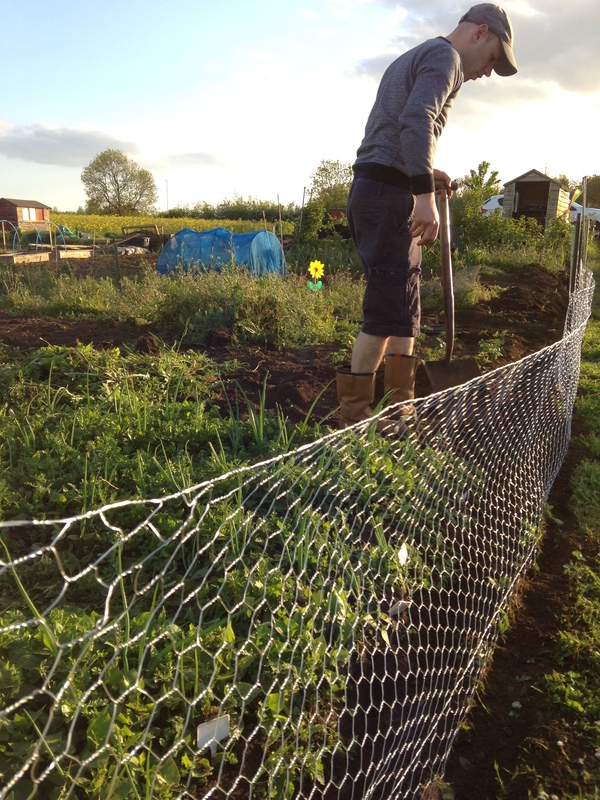 With our greenhouse bursting at the seams with plants ready for the allotment, we decided last weekend it was about time we put up a rabbit proof fence. Last year we had a bit of a problem with rabbits and pigeons getting to our veg before we did so this year we have decided to try everything we can to protect our plot. So we got ourselves some huge stakes and a 50m roll of rabbit proof fencing. Then we got to work. 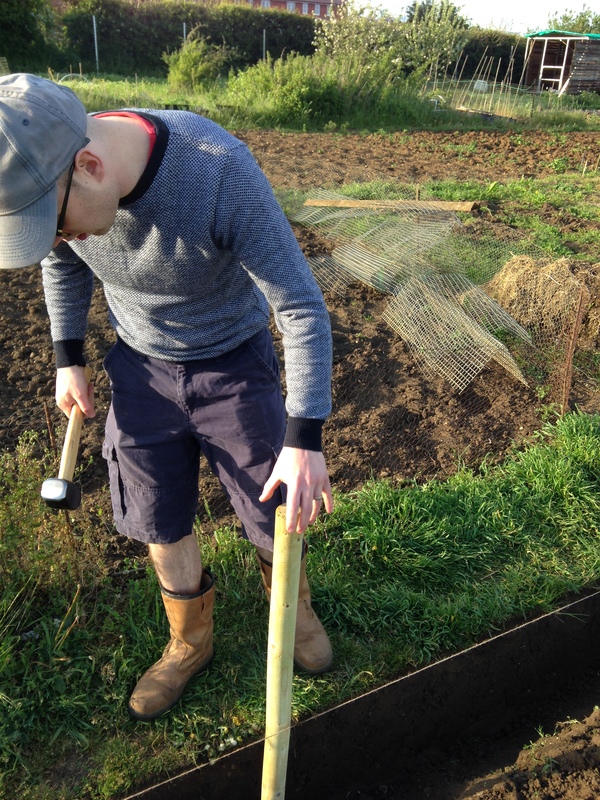 First, we dug a trench the entire length of the plot, so that we could bury enough of the fence to stop any rabbits who might try to dig under the fence. Then we hammered in some wooden stakes at each end and one in the middle of each edge. Then was the tricky bit. We cut and laid out the mesh, folding the bottom up to make a kind of loop/ ‘L’ shape. We then had to turn ourselves into Mr.Tickle and try and hold massive bits of mesh still whilst simultaneously hammering staples in place. So far we have managed to finish the two lengths, we still need to finish the two ends. 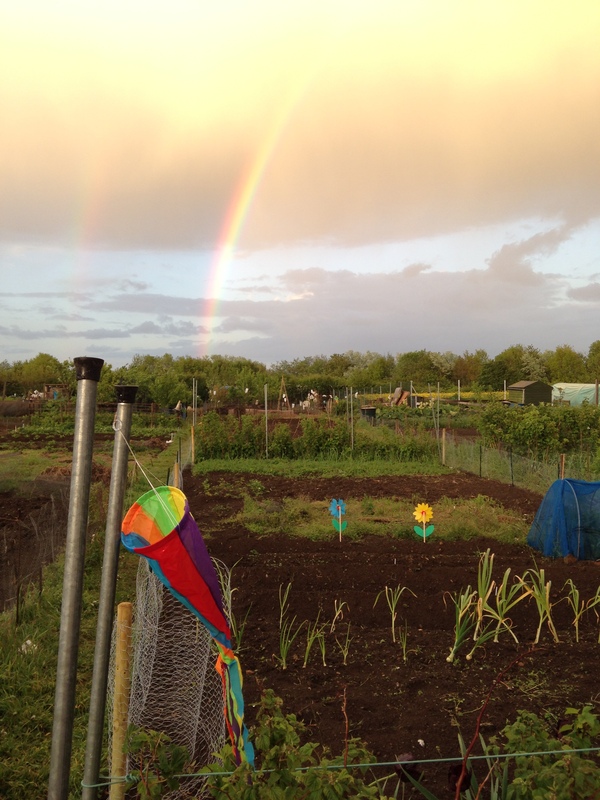 We’ve left those for the moment as I need to weed around the onions and fruit at each end of the plot. We found it was a lot easier to put fence up on pre-weeded ground. I’m really pleased with where the plot is at, the fence makes such a difference, I think it just makes it quite clear where the boundaries are (so that it doesn’t feel like we are trying to weed a massive field). We also got a lot of weeding done whilst putting the fence up. We also got ourselves some colourful windmills and windsocks (which matched the rainbow on Monday). I’ve also tied coke cans to string and hung those around the allotment to make lots of noise. I never thought I would end up doing this, but if it means I will get some fruit and veg this year, i’m willing to give it a go!! Is there anything else I can try to keep our plot rabbit and pigeon free?